A small copyright decision out of the U.S. Court of Appeals for the Seventh Circuit last month has gotten a big reaction from copyright experts. The case is Kienitz v. Sconnie Nation, and it involves an entertaining set of facts. In the 1960s, there was a young University of Wisconsin student named Paul Soglin, who had an anti-authoritarian streak. He led a number of demonstrations on issues ranging from civil rights to the Vietnam War. Indeed, one particular Vietnam protest, in May 1969, led to his arrest for failure to obey a police officer. That same protest became an annual event, eventually morphing into what is known as the Mifflin Street Block Party. Fast forward half a century, and Soglin is now the mayor of Madison, Wisconsin, hometown to his alma mater. The Mifflin Street Block Party is still happening every year, but Soglin is no longer a fan of unruly street gatherings, and in fact he called for an end to the event he helped originate. In response, a cheeky Wisconsin apparel business – Sconnie Nation LLC1 – started selling a t-shirt that poked fun at Soglin’s new, grumpier attitude. 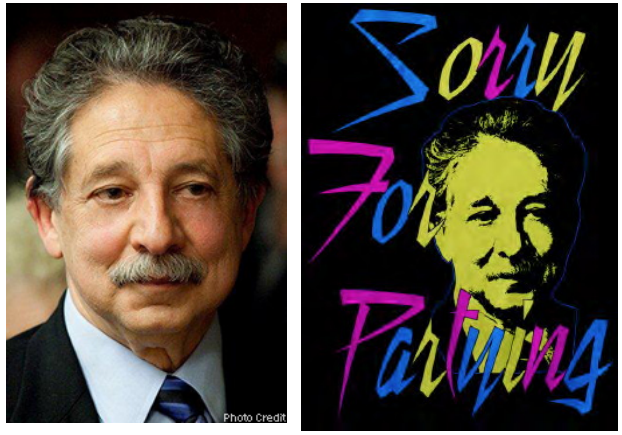 The t-shirt featured a high-contrast image of Soglin’s face, in stark yellow on a black background, with “Sorry For Partying” written around it in large, stylized script. This is where intellectual property law makes an appearance. The t-shirt image was derived from the city’s official portrait of its mayor, which was a color photograph by professional photographer and longtime Soglin supporter Michael Kienitz. Sconnie Nation had downloaded the photo from the city’s website and then altered it, removing much of the detail and rendering it in two colors – yellow and black. (The original photo and the stylized version on the t-shirt can be seen here.) Soglin was not amused by this mockery, and he contacted Kienitz to tell him of this unauthorized use of the photo. Kienitz then registered a copyright in the photo and sued Sconnie Nation for copyright infringement. Reasonable people can disagree about the importance of “transformative use” within fair use jurisprudence, although the Supreme Court’s most recent pronouncement on fair use certainly put the concept front and center. But to my mind the Seventh Circuit’s opinion in Kienitz v. Sconnie Nation is more interesting in what it does not say than in what it does. You see, the oral argument in the case focused primarily on an issue that Judge Easterbrook does not even mention: whether there was any infringement in the first place. After all, fair use is a defense to copyright infringement – which means that if there is no infringement, there is no need to argue fair use at all. Let us give that issue the attention that the court did not. First, how does one determine whether there is a prima facie case for infringement? The Supreme Court has told us: Look to see if the defendant’s allegedly infringing work involves copying of “constituent elements of the [plaintiff’s] work that are original.” So what’s original about a photograph? Not the features of the photo’s subject, surely. Those originate with the photographee, not the photographer. But subjective decisions about such issues as angle, lighting, and focus can be original to the photographer. Those are the photographer’s art. Second, how do those standards apply to the facts of the Kienitz case? The Seventh Circuit opinion gives us some hints. For example, Judge Easterbrook says that, after Sconnie Nation was done transforming the work, “What is left, besides a hint of Soglin’s smile, is the outline of his face, which can’t be copyrighted.” But if that is the case, why situate the analysis in the fair use doctrine at all? If the parts of Kienitz’s photo that were copied are not the original, copyrightable parts, then we’re done. There’s no need to consider applicable defenses like fair use. Perhaps the court decided that the fair use outcome was more certain, and so assumed for the sake of argument that there was infringement. It’s not uncommon for judges to skip a difficult issue in order to reach a later, more clearly dispositive one.2 Yet that does not seem to be the court’s reason for abandoning the prima facie inquiry that occupied so much of the oral argument. Indeed, in both the oral argument and the written opinion, Judge Easterbrook was dismissive of the argument that any original elements of the photos survived in the t-shirt. It seems like the court could have gone with that argument instead. I would suggest, however, that the court may have made the right choice after all, because Judge Easterbrook’s comments on the plaintiff’s prima facie case were arguably overly simplistic. Did the process of making the photo into a cruder, high-contrast image really eliminate the photo’s original elements, as he implied? There’s an argument that it did just the opposite: that a lot of what was left over in the new version was the angle and shading and lighting (which represent the photographer’s art), rather than Soglin’s wrinkles and other detailed facial features (which do not). 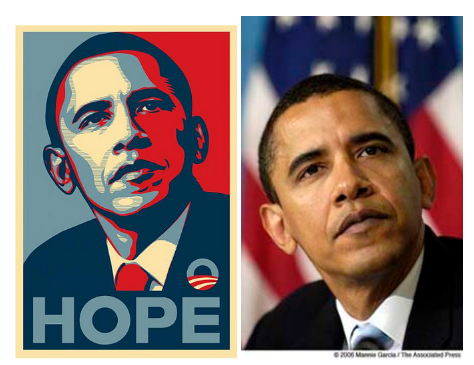 An even more interesting example is the famous Obama Hope poster, which used multiple colors to preserve a lot of the shading in the underlying photograph, even as it made it highly stylized. One final thought. There is another way to end this sort of litigation at the prima facie stage, and that’s to say that choosing a particular angle, focus, and lighting in a routine snapshot is not original enough in the first place. After all, another necessary element to prove prima facie infringement is “ownership of a valid copyright.” A more demanding originality standard would preserve copyright protection for Alfred Stieglitz, Annie Leibovitz, and Ansel Adams, but not clutter up the Internet with copyright protection for the millions of images that take not a moment’s thought to compose and capture. But current law gives us a very permissive originality standard – and with it, we get increased importance for doctrines like fair use. 1. Sconnie Nation makes apparel and accessories that celebrate Wisconsin. “Sconnie” is a term of endearment that describes anyone who is from Wisconsin or who just really likes cheese. 2. Note that, over time, there may be a cost to skipping directly to fair use, even if the doctrine clearly favors the defendant. When courts do not make a plaintiff show that there was infringement, that can put undue weight on the fair use doctrine as the silver bullet for all of copyright’s problems – making earlier parts of the plaintiff’s case, on which it bears the burden of proof, seem pro forma.